Everyone wants to be the boss. People like to be in control; of their lives, of their relationships, etc. Designers, I believe, especially the good ones, are actually control freaks. But there are those of you out there who are passive designers. Passive designers have a hard time making solid choices and lack confident direction. You are easily swayed by other’s opinions and have a hard time selling your ideas because you don’t know for sure if what you did was right. I’m talking to you today. Because having this attitude will result in less affective designs, uninteresting design choices, and a loss of hierarchy. 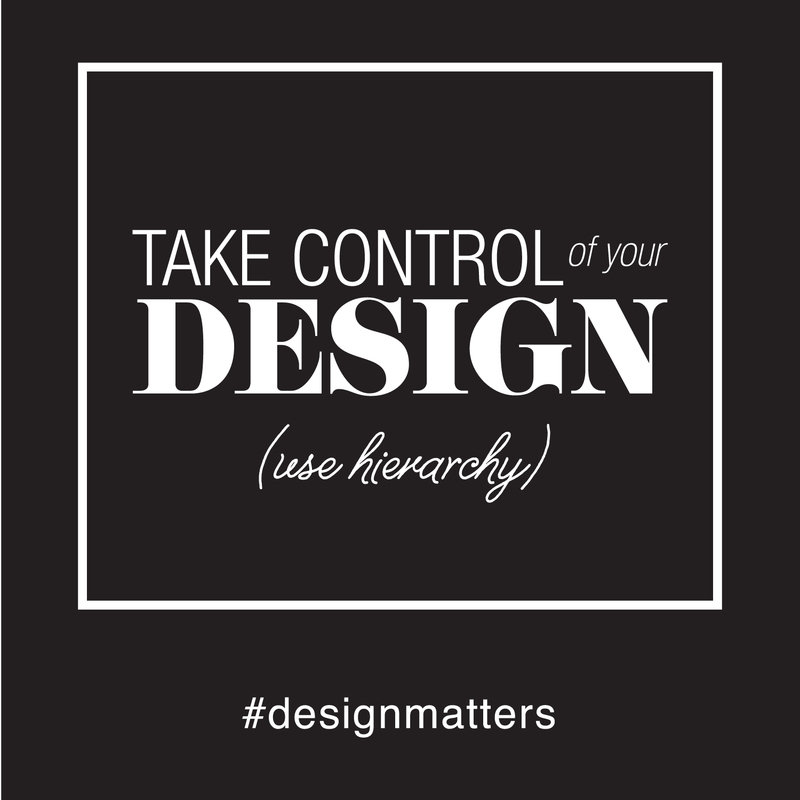 Today I’m going to tell you why you can and should be the boss of your designs and how you can use hierarchy as a map to get you there. Step one sounds easy, but can sometimes be the most difficult. Essentially you need to start believing in yourself and your skills. Be confident. Every one of your design choices has power. As designers, it is our job to sort of, tell people what to do. We tell people to “look here” or “read this”. We can control how the viewer reads or follows our designs. We can even have a level of control over the psychological responses they have by controlling the colors, type, and images we use. This is an enormous responsibility, but a really fulfilling one. The only way we embrace our responsibilities is to own our choices. Own our place as the maker, as designer, and as the boss of the design. Owning this requires a confident use of hierarchy. One of the hardest things to grasp and really get good at in design is hierarchy. Hierarchy is the arranging of elements to bring emphasis to certain elements over others. There are lots of ways to create hierarchy (size, color, etc.) in your designs that are more practical that I will address in a future post. However, these practical tips won’t mean much if you don’t have the confidence to take control of your design. Passive designers let the elements control them, confident designers control the elements. You get to choose what you want people to do with your design (based on your research); how you want them to read it, and how you want them to feel. I’ve seen so many designers get discouraged or just throw a design together haphazardly because they feel like they don’t know what any good choices would be in arranging their elements. This often happens when they think the design is going off-track and they don’t know what to do about it. Then they lose control. When really, you should never feel like your design is out of hand because you have the choice to take the elements and create good hierarchy. So how do you take control of your designs and create hierarchy if you are a passive designer right now? What if you have close to zero confidence in what you are doing? Well, as I’ve said before, step one is to own that the design is yours. A design does not create itself. Every design needs a designer or a creator. Something beautiful, amazing, or clever will never appear magically of its own free well no matter how long wait. The blanks sketchbook or art board is yours to command! This may sound overwhelming, but you should view it as a huge opportunity. You have so many important and honestly, fun, choices to make when you are creating a design. You get to choose colors, layout, typefaces, images or illustrations, or how it will be printed; you do. Once you are able to just own and really love the idea that you are the one in control of the design, you will be able to make decisions that will guide your design. Practically, how you take control to make the decisions that create hierarchy, starts before the rendering step in the process. Once you’ve done all of your research and initial sketching, then you are ready. You should first decide on the hierarchy of your design before you go to your computer to search for typefaces, colors, images, etc. Start the old fashioned way, with a pencil and paper. You have to make a list of all the elements that your project will have then determine the importance of each one. Let’s take a gig poster for example. You know that your poster will perhaps have a band name (or names), venue, date and time, ticket prices, a website, and of course the graphic elements. So write the names of these things down in a list. At this point you get to decide, based on your target demographic and the environment that this poster will be in, what you want the audience to focus on. The best way I have found to do this is to number your elements. (see photo) You number them one through whatever; one being the most important, and go on from there. Then you can start gathering and assembling your design elements following this hierarchy road map to make sure the focus is where it needs to be. This list serves as your blueprint to refer to when you are knee deep in your design and feel like you may be losing track. There are lots of ways to create hierarchy that I will talk about in detail next week. But steps one and two are to know that you are in charge of what happens with your design, and then plan it out. How to check your choices. Every choice you make should go back to your list as a self check. Once you’ve put together a design, there are a couple of additional ways you can check if what you’ve designed matches up to your “blueprint”. 1) Show your design to someone who has never seen it and ask them to tell you what they see first, second, third, etc. 3) Take your design into Photoshop and apply a strong blur filter, then look at it and see if you can still identify the hierarchy. All of these things will allow you to have a better perspective on if you are doing your job. The more often your designs pass all of these self checks, your confidence in your own decision-making will sky rocket and you’ll be able to do this more often and more consistently. So take charge of your design, own the responsibility of being an awesome graphic designer. I hope this post has encouraged you that there are ways to overcome indecisiveness and insecurity in your skills. Stop being a passive designer and take charge of your work. Design is a wonderful world. I hope you’ll join me here. Because design matters.